To sign up to the Leader Lights Newsletter, simply click the Request Newsletter button below and you will receive amazing special offers, discounts and access to secret sales. Gorgeous modern home lighting at amazing prices! Leader Lights bring you exquisite quality lighting products for the home and commercial environments, all at amazingly low prices. Finding the perfect lighting couldn't be easier, thanks to the wide-selection of quality contemporary modern products on offer. Sign up today to receive exclusive discounts off thousands of delicate and charming lights, as well as the latest in modern product designs and up-to-the minute new releases. The Summer Sale is now on! With a simply stunning collection of indoor and outdoor lighting now on sale, you can light up your home and garden with huge savings across some of the UK's most popular lighting brands. Browse thousands of products online from Grok, LEDS C4, Impex, Endon and many, many more top lighting brands. Stunning products all at amazing prices. Free express delivery over £100. Same day dispatch/next day delivery available. With literally thousands of lights available, you can choose your favourites from our pendant light, wall light, chandelier, table lamp, spotlight collections and light your home the Leader way. 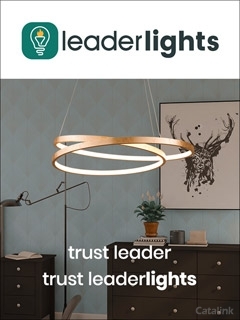 Make sure you sign up to the Leader Lights newsletter today and start receiving exclusive content & products right away! By Pressing the Request Newsletter button you give Leader Lights (and their Data Processors for the specific purpose of delivering your emails) consent to send you their newsletter via email until such time as you choose to unsubscribe.